When it comes to visual arts, I’m not particularly gifted. Having dyed clothing in the past, my abilities usually led to a greenish brown swamp color. That’s why I was a bit apprehensive when I arrived at Liisimari’s silk scarf painting workshop at The Hive in Thao Dien. However, after meeting Liisi, I knew I was in talented hands. Liisimari was born and raised in Estonia. She holds a Masters of Arts in Education from the Estonian Academy of the Arts and a Bachelors of Oil Painting from University of Tartu. She is also skilled in watercolor, blacksmithing, Chinese painting and ceramics. 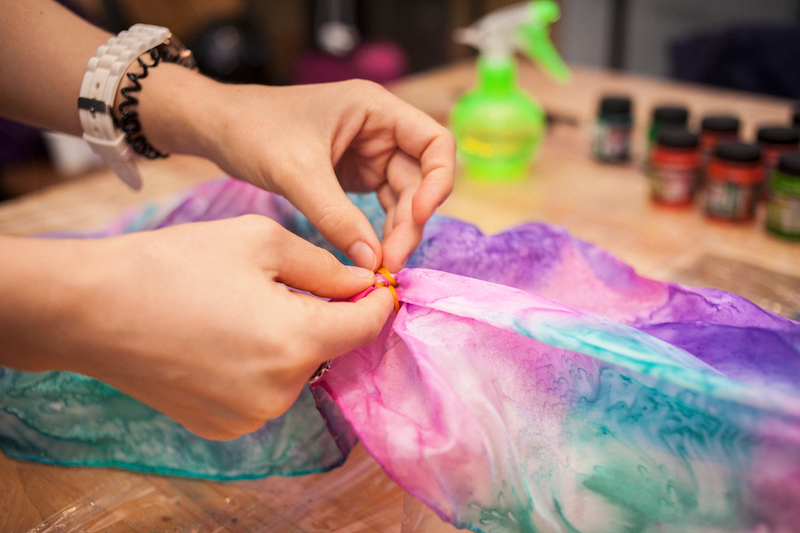 However, Liisi discovered her true artistic passion at age 14 when her mother taught her how to paint silk scarves. The day we met, she was dressed fabulously in a jumpsuit featuring one of her creations. Liisi showed me various funky ao dais she has designed and sold—wearable art is kind of her thing. Since moving to Vietnam, she has been painting scarves on a regular basis for two years. The process is freer and lighter than oil painting and the delicacy of each piece is what draws her to the practice. 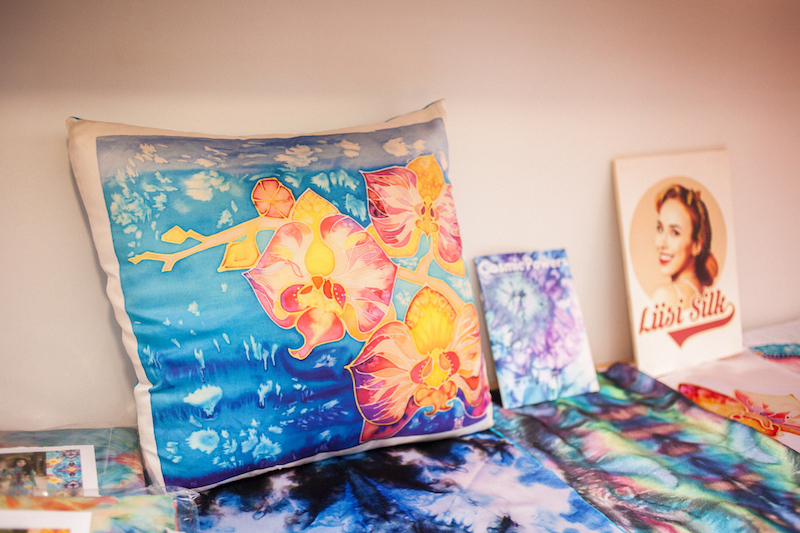 Her mother is an artist as well, and silk painting is a popular art medium in Estonia. This style of silk painting uses a wide variety of colors and “there are no wrong answers,” says Liisi. Her inspiration comes from nature, with orchids, lotus flowers, palms and wolves often making appearances in her work. 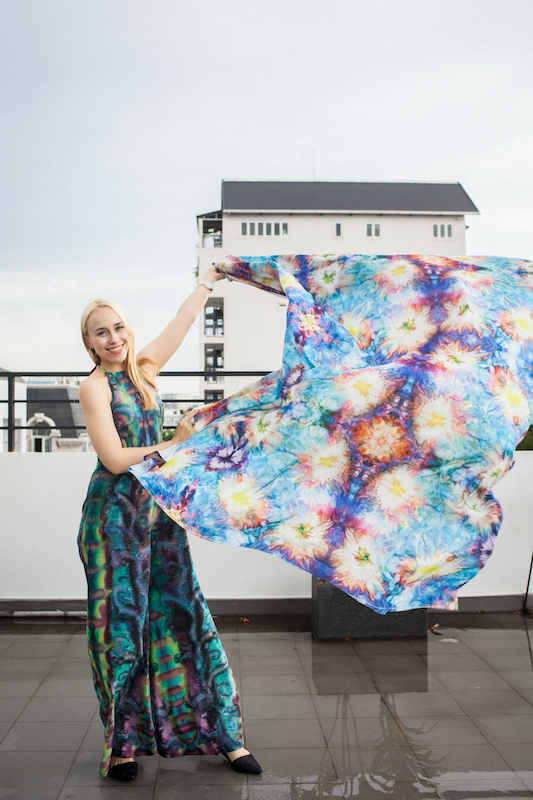 She refers to the styling of many of her silk scarves as cosmic, inspired by space and filled with explosions in the universe. Liisimari and her husband, Arius, set up the workshop together. They were warm and welcoming, immediately making me feel comfortable and not at all like I was going to embarrass myself. Plastic wrap had been carefully placed over a long table that held everything we’d need: nearly 40 bottles of paint, a water spritzer, paint brushes, cups, and rubber bands. Liisi showed me an example of what we would be making and I was curious as to how everything would meld together to create one final piece. She then handed me the silk we would be using. This specific silk for the scarves is shipped in from the US. It has to be a bit rawer and lighter to the touch than the composite silk used for pillowcases and ao dais. Liisi put on some soothing music and we spread the material out on the table. Then came the fun part: picking out the colors. She told me to choose four or five, and I was very particular as I didn’t want them to clash. She recommended a very bright color to create an “explosion” so I selected hot pink. I then settled on magenta, violet, emerald and teal. 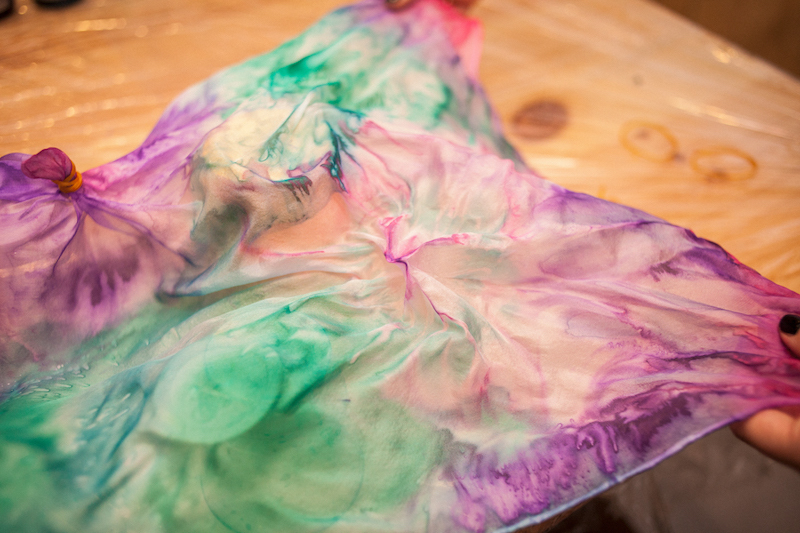 We used eye droppers to take the silk paint from the paint jars and transfer it onto the palette. She showed me how to tie rubber bands around various small sections of the scarf. These would be where we make our “explosions.” I opted to do quite a few of these and because I was concerned about balance, I made sure they were spread evenly across the silk. Next, Liisi dipped a brush in the hot pink and painted above the rubber band. Taking a darker color, she expanded onto the rest of the fabric. Then, she took the spritzer bottle and lightly sprayed where she had just painted. The colors spread in watery drops, blooming gracefully across the fabric. It was now my turn to start painting, and I did so under her watchful eye, but she also allowed me creative freedom. Once I had painted about half the scarf, we sprinkled salt onto the fabric. This creates texture as the salt melts into the paint, giving it an oceanic touch. I then continued to paint the rest of the scarf, sprtizing and sprinkling as I went along. With the paint portion complete, we then needed the help of a hairdryer to speed up the drying process. Liisi showed me how to gently hold the dryer far enough away from the fabric to not damage its delicate nature, but close enough to not take too much time. When the fabric had dried, we pulled off the rubber bands to see large circles of color blossom. It was gratifying to watch something I was uncertain about come to fruition. We were nearing the final stages. We had to brush off the remaining unmelted salt and then gently iron the scarf. Ironing the scarf fixes any color that doesn’t set properly and, of course, gets out the wrinkles left from the rubber bands. After ironing, my scarf was complete. It turned out to be, dare I say, a visually luminous and fluid piece of fashion, reminiscent of a jewel-toned sea. Liisi and Arius told me it’s one of the best they’ve seen, and I’m pretty darn proud of it. In addition to her silk scarf/fabric painting workshops, Liisi also teaches children’s art, as well as mommy-and-me workshops and classes. Visit her Facebook page: “liisisilk”, for more info.